Chariton, Iowa, July 8, 1893. My dear Nellie, I was surprised beyond measure, this afternoon to receive even so short a communication from you as a postal card - I was very glad to know that you were all well, and we would be glad to hear again from you. Charles F. B.- address is Minneapolis Minn. 345 East Franklin Ave. I wrote GrandMa B. Sunday and received a letter from her yesterday. With kind remembrance to you all. Yours O. A. Bartholomew P.S. 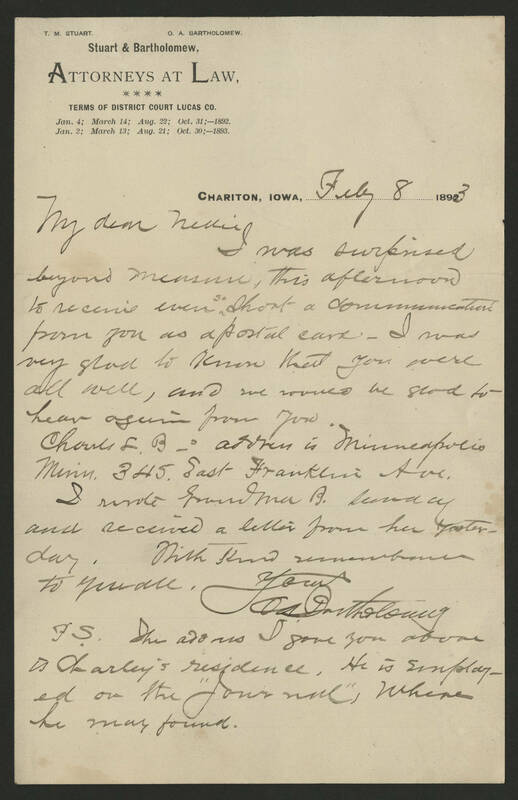 The address I gave you about is Charley's residence. He is employed on the "Journal", where he may found.